Whether you look out onto sweeping lawns, flower borders, hedges or landscaped views, you’ll want the area around your home to look its best and be ready for you to enjoy whenever you want. If you’re happy for others to carry out all the green-fingered work, it makes good sense to choose our friendly and experienced team of seasoned professionals here at Rick Tyler Landscapes. Our experienced and friendly team provide the ideal gardening solution, whether they're cutting your lawn, weeding and mulching those flowerbeds, trimming your hedges, or clearing leaves and litter. We clear up the garden waste as we go, and have as much of it recycled and composted as possible - we always try to be environmentally friendly with our work. For well over ten years, we’ve been trusted to provide a professional gardening service to a wide range of houses and other residential properties – and are happy to show you our references! We'll plan only the regular weekly, fortnightly or monthly visits your property needs, and carry out the work at a time that suits you, making sure you can enjoy your garden whenever you want. Our vehicles are branded, our staff uniformed, and we try and use the same team on each visit. They are trained to the highest professional standards, and we replace our equipment and tools annually for best results. We also have have our own quality control procedures, including spot-checks, and our vehicles carry a wide range of sundries, such as stakes, feeds, and mulches, allowing us to be proactive in improving your garden. All necessary CRB checks and health and safety, public liability, and employers' liability insurance policies are in place. We know that every garden is as individual as the householder. Call us on 01707 324 262 or 07986 224 09 now for a free discussion about how you want your garden to be. We also guarantee to beat any like-for-like quotation! 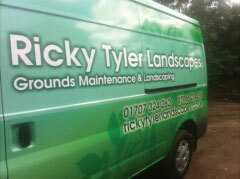 Ricky Tyler Landscapes can provide gardening and grounds maintenance services including House Garden Maintenance covering London, Essex, Hertfordshire, Northampton, Buckinginghamshire & Bedfordshire .